Audio-Technica U857QL Cardioid Condenser Quick-Mount Gooseneck Microphone Black 18.64 in. Designed for pro-level sound reinforcement, recording, and broadcasting. Ideal for conference centers, boardrooms, courtrooms, houses of worship, and other installed applications, the U857Q is designed to plug directly into a panel- or desk-mounted XLRF-type connector. This cardioid condenser quick-mount gooseneck microphone offers unsurpassed immunity from radio frequency interference thanks to Audio-Technica's UniGuard(TM) innovations. 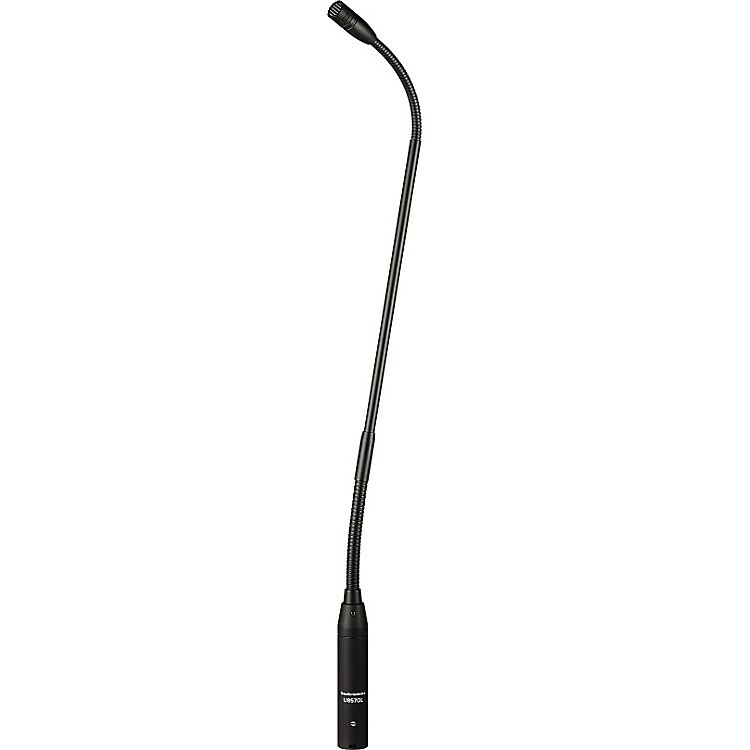 The 14.47" long microphone features an ultra-flexible small-diameter gooseneck and accepts interchangeable elements, available in cardioid, hypercardioid, omnidirectional and UniLine(TM) line cardioid polar patterns. Equipped with self-contained electronics, the phantom-powered microphone also offers an 80 Hz low-cut UniSteep filter that reduces pickup of low-frequency ambient noise. An excellent and convenient microphone. Order today. MAXIMUM INPUT SOUND LEVEL: 139 dB SPL, 1 kHz at 1% T.H.D.